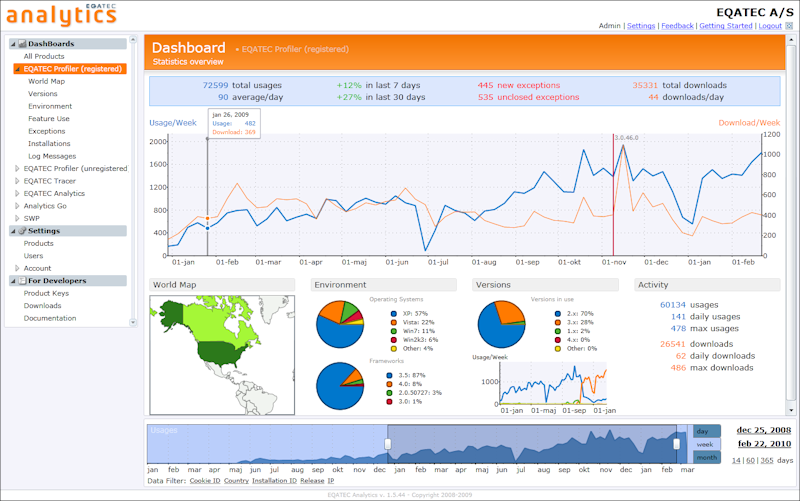 EQATEC Analytics is a SaaS solution that is designed to give a detailed answer to the question "how is our software used by our users?" Any organization developing software will like to know these answers, because they can help the organization make better decisions based on facts rather than gut-feelings. The answers are provided through collection of data from the software applications being monitored by the service. The answers are valuable for marketing, product management and development. The EQATEC Analytics service consists of three parts. A server hosted by Amazon Webservices, the EQATEC Analytics Monitor library that is integrated in the application that should be monitored and finally a Silverlight web client through which the data collected is presented. Integrating the EQATEC Analytics Monitor into an application takes from two hours to a couple of days depending on the granularity of feature tracking that is needed. Data is transmitted from the application to the EQATEC Server through the Internet. Data transmission is kept at a minimum and data is cached locally until an Internet connection is available.